Geoff Notkin hosts STEM Journals for Cox Media and the multi award-winning television adventure series Meteorite Men for Science Channel. He has also appeared in shows for Discovery, NASA EDGE, TLC, PBS, A&E, National Geographic Channel, History Channel, Travel Channel, and the BBC. 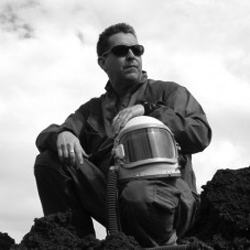 Geoff is a science writer, producer, publisher, photographer, world traveler, and the owner of Aerolite Meteorites LLC, a company that provides meteorite specimens to collectors and institutions worldwide. He has appeared on Coast to Coast and the Today show, and has been interviewed by The Washington Post, The Huffington Post, Space.com and many other leading publications. An award-winning author, Geoff has published more than 150 articles with his work appearing in USA Today, Wired, Reader’s Digest, The Village Voice, Astronomy, Astronomy Now, Sky & Telescope, All About Space, Seed, Rock & Gem, Geotimes, Meteorite, and many other national and international publications. He is the author of the books Meteorite Hunting: How To Find Treasure From Space and Rock Star: Adventures Of A Meteorite Man, and a popular science and arts blog, The Logical Lizard, for TucsonCitizen.com. Expeditions have taken Geoff to forty-five countries and some of our planet’s most remote areas including northern Siberia, Chile’s Atacama Desert, the Australian Outback and he has three times crossed the Arctic Circle. The minor planet 132904, discovered at Mount Palomar, was officially named Notkin by the Minor Planet Society in recognition of Geoff’s contributions to science and education. Geoff was born on 14th street in Manhattan and grew up in London, England. He studied film history with Dr. George Weyant in London, and attended college in Boston and New York. He now resides in the Sonoran Desert of Arizona.